Thank you for your patience in this reading. I’ve asked our guides for their help in what you need to know about the other person and any advice they can give. 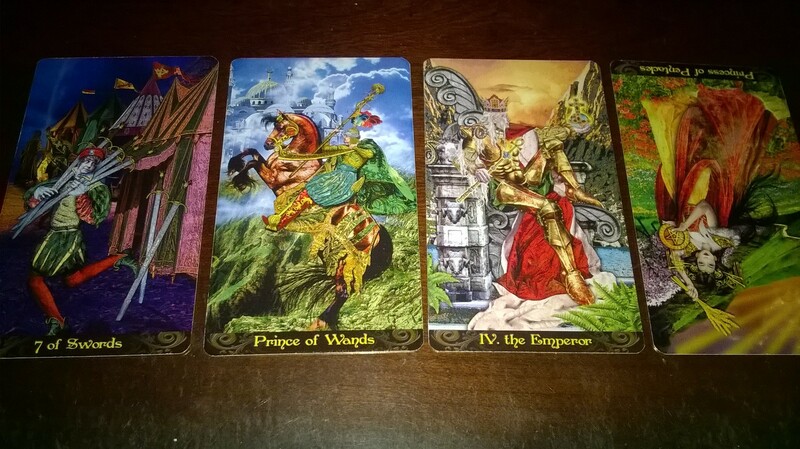 I’ve drawn a 4 card spread: Seven of Swords, Prince of Wands, The Emperor, and Princess of Pentacles (reversed). Possibly there was deception in the past if you were in a relationship with that person. Maybe they or you were not ready to settle down, or hid something from each other. You are currently rushing into things without thinking. Maybe rewind previous experiences in your memory and see if you are just following your heart without thinking first. This may be a little reckless. Either this is a guidance from our guides or you have already done this, but the reading suggests to get guidance from an older father figure, could be your father, grandfather, priest if you are religious, but this person can help you give you direction and sort out your dilemmas. Also in wanting to get in touch with the other person, you are possibly only looking at the short term, and fulfillment of now, but not looking at the long term effects. I don’t see that the person will contact you, but you may be contacting them. This is your choice to do so because your future depends on the choices you make in your life. But from the reading, it looks like maybe contacting that person is not the most favorable idea.